Join our conversation with Mike Louis, Owner of Push Fitness, 1025 S Mason, Katy, Tx. Mike is a alumni of Spring Woods and a former student athlete winning multiple accolades through his career. Contact Mike at 832-275-8006 for all your fitness and athletic performance needs. 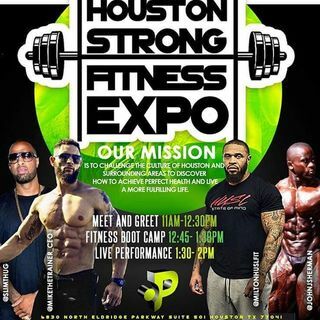 Also support Mike Louis's upcoming Houston Strong Fitness Expo. The Houston Strong Fitness Bootcamp Spring 2018 is an indoor and outdoor public event. It is our goal to challenge the culture of Houston and ... See More surrounding areas to discover how to achieve perfect health and live a more fulfilling life. The goal of our hosts is to leave a legacy for the next generation to make healthier choices and live a longer life of health, wellness, & fitness. life style, while bringing the Houston community together for a positive day of events. healthy, wearing the hottest clothing, and everything in between. We invite everyone ages 12 and up to come be educated, engaged, and connected to your local nutrition & fitness experts.